It's time for yet another LitFuse Blog Tour! This one is from a genre I don't review often. Basically a military thriller/romance. 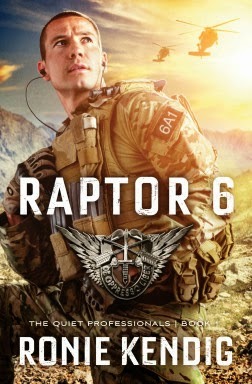 Raptor 6, by Ronie Kendig, definitely kept me glued to my seat. With about eight pages remaining, I finally felt I could put the book down and go to bed. I chose to finish those last pages, but I did actually count. Captain Dean Watters keeps these parts of his life in laser-like focus. So when hackers threaten both his mission and his team, Dean's Special Forces training kicks into high gear. Ten military super-secure computers are missing-which if opened, would give America's enemies a blueprint of US military intelligence. Failing to stop the hackers isn't an option. My thoughts: Well, obviously, I already told you I could not put the book down. It's weird, sometimes. I got the book, took one look, and asked myself what in the world I was thinking in asking to review this book. So it sat for awhile. It has been a rough month, with lots of demands on my time, and reading about terrorists and cryptology just didn't sound relaxing. I was definitely right about that part. It wasn't relaxing. I picked the book up, intending to read only a couple of chapters. Until the kids settled down. A few hours later, I looked at the clock. Four. In the Morning. And there were 8 pages left. Why not just finish it? So I did. I read Kendig's bio today. An army brat, married to a vet. It definitely explains how she wrote Zahrah so well, and it also explains her writing of Dean. Most of the time, when you are shifting back and forth between being "in the heads" of the main male character and the main female character, you are definitely able to tell whether the author is male or female. Well, I wasn't sure as I read this one. I thought about that a couple times in the story, but never could tear myself away from the action to find the author's name. I know, it would take five seconds to look at the cover. Silly of me. Like many thriller types of books, the plot at times stretched the limits of credulity. Not horribly, but still. One other thing I didn't like was I had a tough time keeping track of the members of the Raptor team. Especially when it switched from using last names, to using first names, to using nicknames, and back to last names again. I had wished I had taken notes at some points. Minor quibbles though. This is an action-packed book, and I love how faith weaves its way into the storyline.